Perhaps the most widely known vocal mic in the world, the SM58 celebrated its 40th anniversary in 2006. 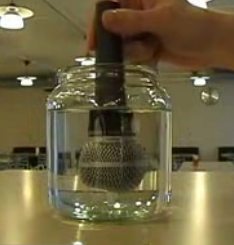 The ball grille contains a foam blast filter. The ball grille reduces the bass boost due to proximity effect, simply because it prevents the mic’s capsule from being positioned so close to a sound source. The dynamic cartridge has a different resonator disk than is found on the SM57 (although the cartridges are internally identical). The mic can be used with the ball grille removed, but beware that the diaphragm would then be exposed, and therefore easily damaged. 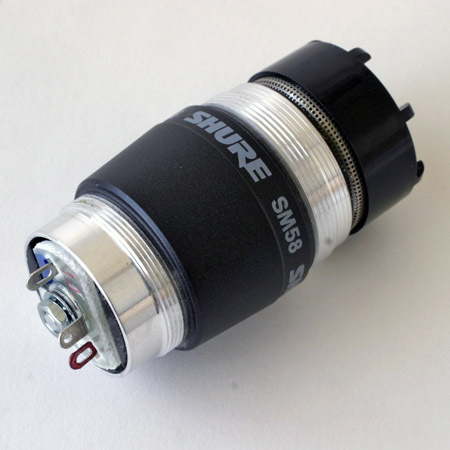 Replacement capsules (p/n R59; street price ~$70) can be obtained from Shure, and easily installed by soldering two or three wires. The mic’s “pnuematic shock-mount system” insulates the cartridge from mechanical vibration in a way that is superior to typical mechanical isolation mounts. The result is that Shure’s SM-series dynamic microphones have lower handling noise than competitive models. Check out the SM58 torture test — a YouTube video in which a new SM58 is hammered, dropped, dunked, frozen, and driven over — twice — and continues to work. (More or less.) In Part II, the mic is buried for a year. How is the SM58 different from the Beta 58? The Beta 58 has a supercardioid pickup pattern. The Beta 58 has a 4dB hotter output than the SM58. The Beta 58 has less handling noise than the SM58. The Beta 58 has a hardened grill that is very difficult to dent. The Beta 58 has extended low end and high end compared to SM58. … in other words, it’s a completely different mic, and it sounds different. The transformer can be removed; see details on the SM57 page. The stock transformer can be swapped for a unit from TAB-Funkenwerks, giving the SM58 a wider frequency response and a sound similar to the SM7; see TAB-Funkenwerks transformer upgrades for the SM58. The SM58S incorporates an on/off switch. The Shure SM58 is also known as: SM-58, SM58. The mic was released in 1966.